The other day we went to Tesco Mutiara Damansara. Found that they are having Baby&Child Photo Contest. Buy above RM50, get to take photo for free and you can enter the photo for the contest. 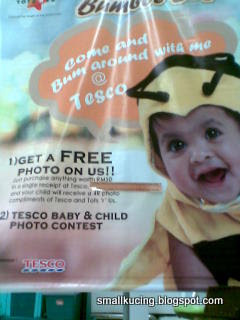 Mamarazzi not sure whether other Tesco branch is also doing this promotion or not. 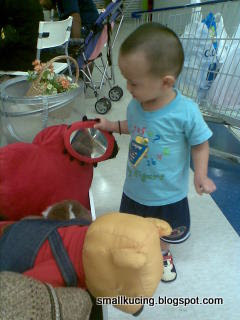 Wah...they put out so many baju and toys for baby to have their photo taken with. Here is my photo. Mamarazzi didn't enter my photo for the contest. Said am old man already wor. 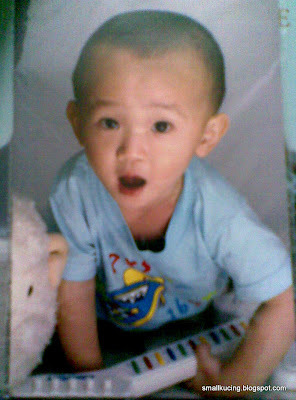 Oh..sorry ya coz Mamarazzi unable to scan the photo in. Just snap again using her handphone camera. The photos were not that nice coz he couldn't sit still. Yup..at least I get a free photo. I think the size is 4R.